Looking for a Used Q7 in your area? CarGurus has 14,242 nationwide Q7 listings starting at $4,995. Yeah, it’s looking a bit frayed around the edges, but Audi’s Q7 full-size luxury crossover still hangs with the best of ‘em for 2015. Rumored to be in line for a hefty (and overdue) makeover, possibly for the 2016 model year, this posh 7-seat people-hauler boasts some nimble handling for its size, as well as supercharged power and a wealth of standard appearance goodies and creature comforts. Cargo space, at some 72.5 cubic feet, is, unfortunately, not up to most comparably sized rivals, while the third-row seats once again challenge the joints of even average-size adults. Be that as it may, look for this hefty crossover ute to again come in 2 essential trims, the 3.0T and the turbodiesel-powered 3.0 TDI. Each trim should again be delivered in either Premium Quattro or Premium Plus Quattro variants, with the 3.0 TDI additionally available in the Prestige version and the 3.0T Quattro upping the posh ante with the top-shelf S Line Prestige trim level. Of course, bearing the Quattro designation, all Q7 trim levels come with standard all-wheel drive (AWD) that adds significantly to maneuverability on dry roads with constant torque redistribution between front and rear wheels. When roads get slippery, this legendary AWD system automatically diverts torque from the wheels that slip to the wheels that grip to keep the Q7 going strong. There’s even a selectable off-road mode that works with the stability control system to ensure a comfy and continuous ride through the backwoods. Do not, however, expect this system to handle any serious rock climbing. Anyhow, a number of improvements are expected in the 2015 Q7 lineup, including a standard full-body exterior paint finish and a pair of new options packages. An available new Off-Road Style Package is slated to encompass unique black-optic exterior styling touches, black roof rails, off-road-style fender flares, skid plates and 20-inch upgraded wheels. The debuting Sport Style package, meantime, also offers the black roof rails, along with distinctive bumpers and fenders, twin oval exhaust tips and 21-inch gloss-black wheels. There have also been whispers of a new grille design and a new MLB platform for the 2015 Q7, with the redesigned underpinnings allowing some 700 pounds in weight savings. However, don't expect these latter upgrades to show up until the 2016 model year or, at best, late in 2015. In any case, driving the 3.0T Premium and Premium Plus Quattro trims is, once again, a supercharged 3.0-liter V6 engine mated with the ubiquitous and quite capable 8-speed shiftable automatic transmission that again boasts descent control and steering-wheel-mounted paddle shifters. Look for 280 hp and 295 lb-ft of torque from the standard version. An optional up-powered edition is delivered standard in the Prestige S Line version and offers 333 hp and 325 lb-ft of torque. Mileage figures for both iterations of this supercharged V6 are alleged to be 16 mpg city/22 highway, while towing is touted to max out at 6,600 pounds with one of the pair of available towing packages installed. Audi’s Q7 3.0 TDI Quattro ensemble, as befits its initials, carries a 3.0-liter turbodiesel V6 powerplant that again combines with the 8-speed shiftable automatic for 240 hp and a heady 406 lb-ft of torque. Mileage is a civilized 19/28 with the turbodiesel, while towing is again pegged (by Audi) at 6,600 pounds when properly equipped. Assuming minimal changes to the profile, appearance features for the 2015 Q7 Premium trim level should again include 18-inch alloy wheels, a roof rack and power liftgate, a rear spoiler and heated power-adjustable outside mirrors. The Premium Plus is expected to again add a power sunroof to the equation, with the S Line Prestige boasting standard S Line appearance upgrades and adaptive high-intensity-discharge (HID) LED headlights and power-folding mirrors. Inside, look for the 3.0T Premium lineup to sport leather upholstery, heated power-adjustable front seats and full power accessories, along with cruise control and telescoping tilt-wheel steering. Rear parking sensors and a remote garage door opener also adorn this entry-level trim, with dual auto climate control and a cooled storage bin also delivered standard. All of this remains complemented, of course, by the classy wood, alloy and leather cabin accents. Techno-wise, the Q7 Premium editions boast Bluetooth hands-free technology, as well as Audi premium audio toting the basic MMI (Multi Media Interface) display, a single-CD player, 11 speakers and satellite radio. Moving up to the 2015 Q7 Premium Plus cabin, look for standard MMI navigation with an upgraded touchscreen display, Audi’s Parking System Plus boasting a rear-view camera with front and rear parking sensors, memory for driver's settings and Audi Connect mobile WiFi access. The top-shelf Prestige S Line interior sports standard 4-zone climate control, Bluetooth music streaming and Audi’s Parking System Plus, boasting a rear-view camera along with front and rear parking sensors. Oh, and this top-shelf trim level also totes Audi Side Assist for safer lane changes. Options choices returning from 2014, meanwhile, include upgraded and upsized wheels and buffed exterior trim adornments, rear-seat DVD entertainment, heated rear seats, a heated steering wheel, adaptive cruise control, corner-view cameras, Bang & Olufsen premium audio upgrades and adaptive suspension damping. Many options are again packaged, with a few available only on select trim levels. 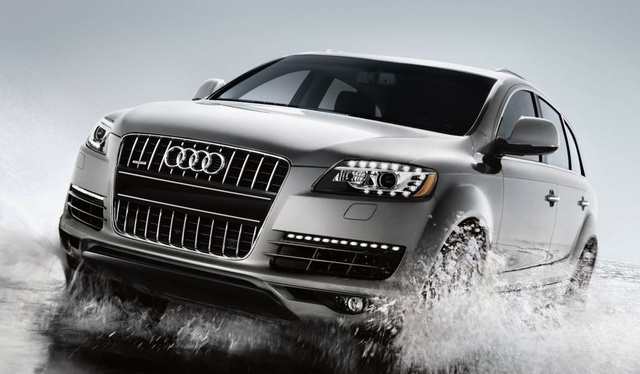 Finally, the 2015 Q7 lineup is slated to carry the usual mandated safety equipment, including antilock brakes (ABS), traction control, front and rear head airbags, front side-mounted airbags and front head restraint whiplash protection. Further standard safety stuff includes LED daytime running lights, front fog/driving lights and turn-signal-integrated mirrors, along with a post-collision safety system and a remote antitheft alarm. Optional rear side-mounted airbags are also scheduled to return for this upcoming model year. What's your take on the 2015 Audi Q7? 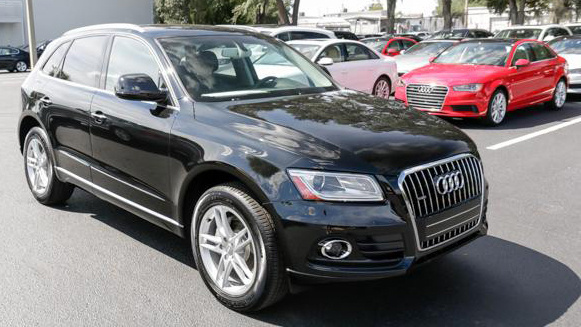 Have you driven a 2015 Audi Q7? instead of financed purchased - do you have leasing options for used and new cars? ?